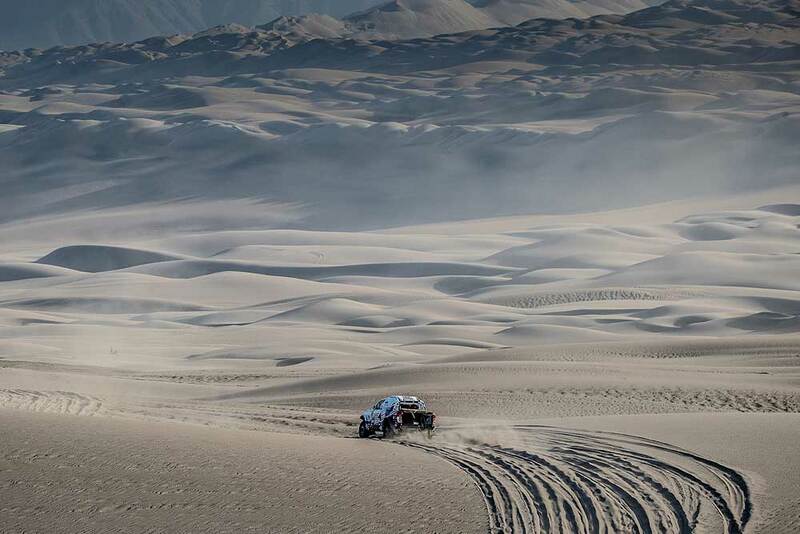 Wednesday’s fifth stage of the 40th anniversary Dakar Rally was announced to be one of the most difficult of the 2018 edition – and not for nothing. The dunes in the 267 kilometers against the clock meant a major challenge for all competitors, including Tomas Ourednicek and David Kripal from Czech South Racing Ford Team, who finished 40th in the day’s classification and thus climbed up to a provisional 44th position in the overall standings. "Today’s special consisted of two parts. The first started quite early in the morning so we had to get up at 4 am," reported Tomas Ourednicek. "There were beautiful high dunes but with very soft sand, so they were quite trick to cross. After yesterday’s experience, we decided to try a different tyre for today. That worked pretty well, but again one of the tyres came off the rim and close to the finish of the first part we had a double puncture. So, we were with no spares left and a 200 km special in front of us." For the team´s big luck, the route to the start of the second part was the same as the assistance route so the crew was able to meet the team. "Although we only had very short time, our mechanics were able to change all seven tyres extremely quickly." "As for the second part, we didn’t expect to have big dunes again and this was a mistake. We faced horrible dunes with very tricky navigation, we lost some time looking for a waypoint and getting stuck several times. Once the car stopped, but we were able to restart and after that it ran well again,” Tomas Ourednicek recalled. "The navigation was really difficult, there was one point that we searched for about half an hour, but in the end, we managed to validate all waypoints and we know that many people had trouble with that," added navigator David Kripal. "But finding the points is one thing, getting the car out of the sand is something completely different." "After the finish of the special, we had more than five hundred kilometers of transfer section to the next bivouac in Arequipa, with the first part of it running on the seashore, so we had the fantastic view of the ocean with white waves and nice beaches. What can I say? Peru is really breathtakingly beautiful," Tomas Ourednicek finalized the day.